A kinematic base is used for repeated positioning of groups of units mounted on its platform. 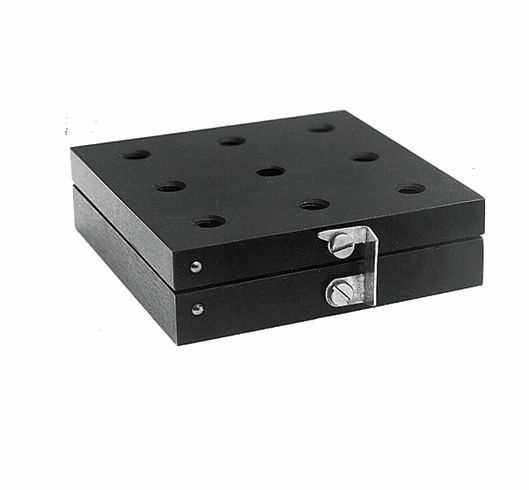 A platform has M6 mounting holes. Alternatively, fit an M6 screw through a clearance hole from beneath. Unhook the platform from the bottom plate and stow it away with all the units still mounted. Later replace the platform, just as it was, with a repeatability of several arcsec. The bases use a kinematic scheme, where three steel balls register with a cone, a v-groove, and a flat. The balls and registers are of hardened polished steel. Hooks prevent a platform from accidental movements. A bottom plate is fastened through clearance holes or a slot. 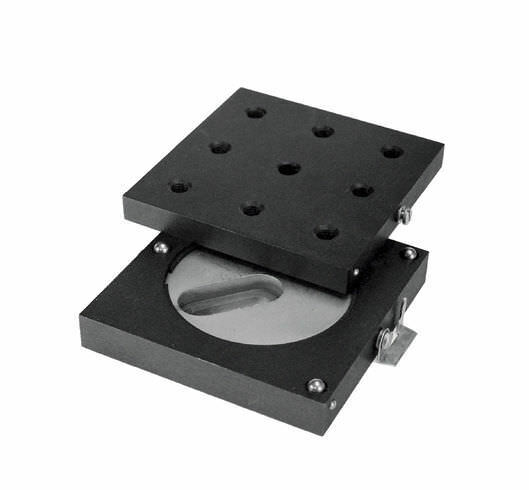 850-0020 has a revolving mounting disk – a degree of freedom of positioning.